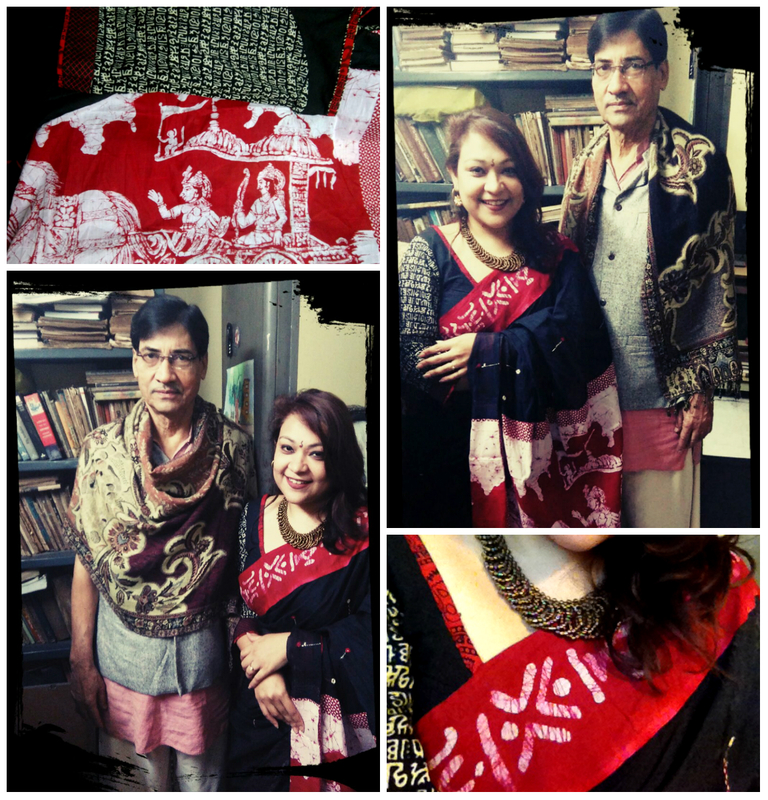 100sareepact | To Sir, With Love…..
85/100 #100sareepact is a vibrant black & red cotton saree. Joined in 4 pieces, this designer saree has a unique look. It portrays a wonderful painting; block printed on the anchal, depicting the story from Bhagavad Gita….The body has small thread-works, appliqué works with batik patches and mirror works. I paired the saree with a contrast designer blouse illustrating Durga namavali in the shoulders, and very candidly wore golden costume jewellery to complete my 85/100th look! As we all know The Bhagavad Gita is the essence of the Vedas and Upanishads. It is considered as a universal scripture applicable to people of all temperaments, across generations. It is a book with sublime thoughts and practical instructions on Yoga, Devotion, Vedanta and Action. However if we think Gita, two of the most significant passages which come to our mind is Lord Krishna’s instructions to Arjuna on the nature of correct actions and the role of God in protecting his devotees. 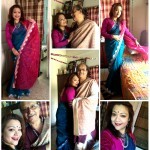 My 85/100 saree depicts Lord Krishna & Arjuna’s moment. And this image immediately connects me with a person (after my father) who was a Maths teacher of Patha Bhavan, Mr Dipankar Sarkar. Our very own Dipankar da or just ‘Sir’! He was a story-teller, philosopher, Tagore-fan, guide, friend, event-organizer, school theatre director etc etc. .…. I was lucky to attend few Maths class at his Kalighat-PotuapaRa home, where we used to enter that famous Benaras galli, to reach his cosy, airy drawing room. In those classes we had dedicated discussions on literature, life and true spirit of Mathematics. He was my encyclopaedia, a person where I was able to surrender at ease…. I can never forget, in one of those darkest hours of teen hood, after losing my mother, he was the one who used to read Tagore and his feelings about death to make me calm. Since the day I started exploring #100sareepact stories, I had a plan to dedicate a piece to Sir. I thought Teacher’s Day or 50 years of school were smaller landscapes for his story in my life! He happens to be a dream which came true of knowing a human being who is closer to completeness. He can be very tolerant against all the odds, have strict values and principles; he is always ready with solution to a problem and guides you with a path if you seek help, and share the truth. When I initiated this evening date with sir for my saree story, he was that same simple person who waited for his student to meet and understand why a photo shoot is required and what is this sareepact all about? ‘Jiboner Alpona’ is a part of his, but those uncountable souls whom he has touched has unknowingly learnt and experienced life’s true philosophy. He is a true Teacher, which our country is lacking now a day.